Some great games to report on this week with our Firsts, U16’s, U14’s, U12’s , U10’s, and U8’s in action for the first time. 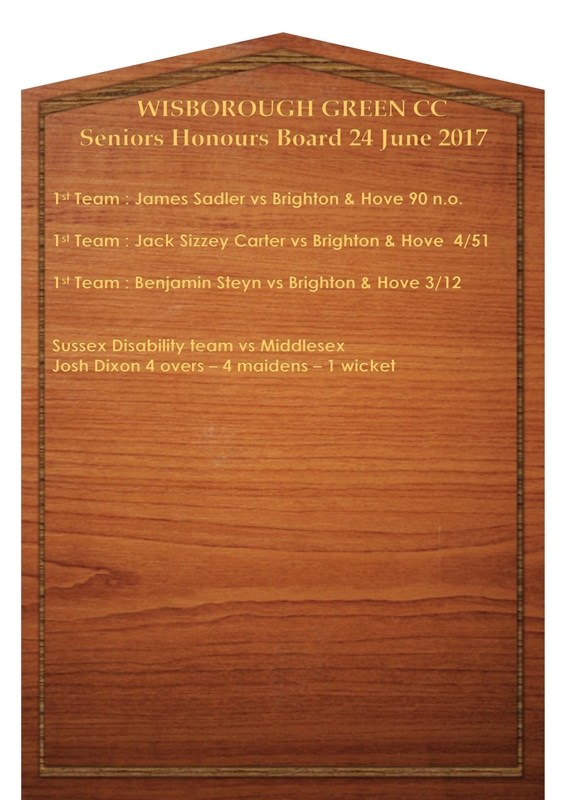 Josh Dixon has been playing for the Sussex Disability team who remain unbeaten so far this season with victories against Middlesex, Gloucestershire, Hampshire and Kent. Josh has taken wickets in each game he has played and posted a top score of 29 against Kent away. His latest bowling figures against Middlesex on Sunday were 4 overs, 4 maidens and 1 wicket. Bonney family have memorable drive home after younger brother Tom outscores older brother Joe. A match Wisborough had to win after 2 disappointing losses. Wisborough won the toss and put the opposition into bat. Benjamin Steyn tasked with opening up and bowling a lively few overs, whilst Jamie Self came up the hill and tasked with restriction. The plan worked well for the first 10 overs with Brighton unable to score freely. However we could not get the wickets. Some hard half chances went down and the batsmen playing and missing every over. On came Jack ‘Fizzey’ Carter and within the 1st over had Wisboroughs 1st wicket. ‘The Fizz’, then had another wicket well caught by Tommy Colbran. Brighton continued to frustrate Wisborough with some stubborn defence. So On came Tommy ‘All Right’ Colbran, who struggled to find the right length in his first over, but a full toss hit to deep mid wicket and well caught by Byron Napper secured another wicket. ‘All right’ and ‘The Fizz’ bowled well, with Tommy bowling a dream leg break to dismiss the opener through the gate. “All right’ finishing with 2 for 31. Back came Benjamin Steyn who bowled quickly, and the square leg umpire was lucky not to have his toes trodden on by the batsmen. Steyn cleared up the tail finishing with 3 wickets for 12. The Fizz finished with 15 overs 4 for 51. Byron Napper taking the final wicket to end the Brighton Innings on 166 all out. Wisborough needed to get the usual good start between Sadler and Dodd, but in the 2nd over a rush of blood from Dodd and the short ball top edged for Brighton to take an easy catch. In came Byron Napper and the score started to build but the bowling was tight and Wisborough had to work for every run. Napper then missed a straight one and in came Benjamin Steyn. Benjamin who is settling in well, but wants to win the match in 3 overs, hit a flurry of boundaries, only to be caught by deep extra cover. In came Joel Colbran fresh from runs in the 2nd X1. Joel looked well in control batting beautifully but mis judged a straight one and was LBW for 14. In came the in form Jamie Self, who with Sadler had to work the ball rather than take many risks. Self and Sadler batted really well, with Sadler passing 50, with 20 overs in the innings complete. Self played like someone who had suddenly realised that batting lasts longer when you take less risks, and just hit the bad balls. Sadler by this time was looking strong and started to dismiss the ball to all parts. The opening bowlers came back on and Sadler was in no mood to hang about any longer so with a 4,6,4 and another 4 the match was won, Self finishing on 23 not out and Sadler 90 not out including 17 4’s and a 6. 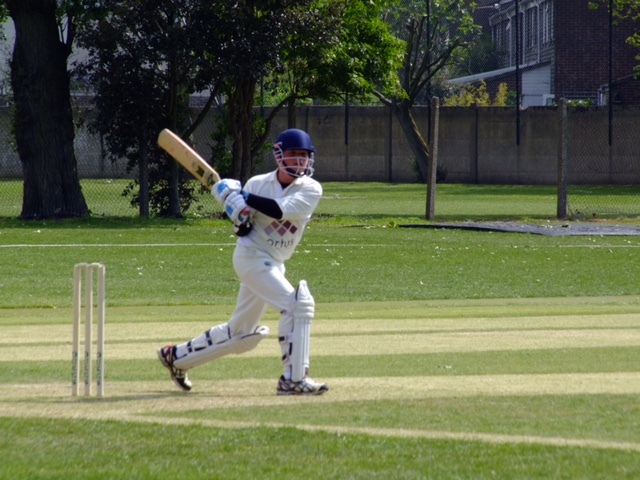 We bowled well, with a varied bowling attack, and fielding was exceptional, especially George Magnus on debut. Delighted with certain bits of the batting display, but still lessons need to be learnt as to how to build an innings. The learning curve seems to be a bit longer than I had hoped. But overall a great and much needed win. Having ventured to Rudgwick’s home ground, the team arrived ready for a big match against some familiar faces. Will D, captaining the team and having won the toss with his call of “heads”, elected to bowl first. 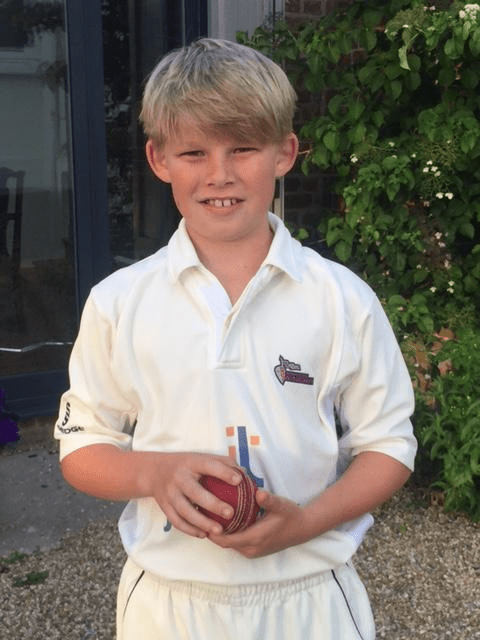 Tom Bonny opened the bowling, showing consistency and form with Rudgwick’s batsmen only able to eek out a meagre 2 runs from his 3 overs, one of which was a wicket maiden! Rudgwick were limited to 254 runs, thanks in part to some clever bowling from Kit (2/17 off 3 overs), Will D (0/9 off 3), Tom Mahon (1/24 off 3) and Fraser Williams (1/14 off 2). 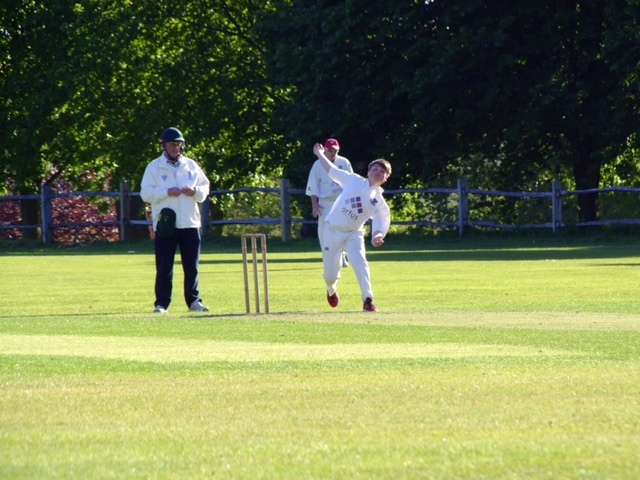 Wisborough produced some fine displays of fielding and in particular, good catches by Will D and fearless wicket-keeping by Wren. Wisborough, having seen off the Rudgwick batsmen, commenced the run chase in fine style. The opening pair made some decent runs but unfortunately lost a few wickets along the way. The final batting pair (Will D and Wren, who was using a runner due to an earlier injury incurred in the line of duty) provided the spectators with some heart-stopping moments as Wisborough, powered into a marginal winning position thanks to a masterful batting display from Will D (30 runs!) only to lose a wicket on the third last ball. The final two balls yielded one further run which meant Rudgwick were victorious by one run. A very close game – very well done to all the players. In their first match, Saturday morning saw the Wisborough Green Colts take on Wood Street CC Village at the very picturesque ground at Wood Street Village. Wood Street won the toss and sent Wisborough Green in to bat. Great batting from Matthew Spacey and Angus Lette saw Wisborough Green put on an opening partnership of 19 runs with both players scoring lovely boundaries. Ben Gwilliam and our Captain for the game, Raffy Finn, followed and batted very well and scored and had a great partnership of 14 runs. Chris Edson and Fizz Gadd batted brilliantly with no wickets falling in their partnership of 22 runs. The final pair Karl Finger and Cosmo Naghan also batted also exceptionally well, with no wickets falling, and increased the total by 18 runs. Congratulations to Cosmo who was our highest scorer with 10 runs. A great team performance with the bat- Wisborough Green finished on a total score of 273 off their 16 overs. The Wisborough Green Colts did a great job defending their total and bowled very well. Some excellent fielding and a great catch taken from Matthew Spacey. 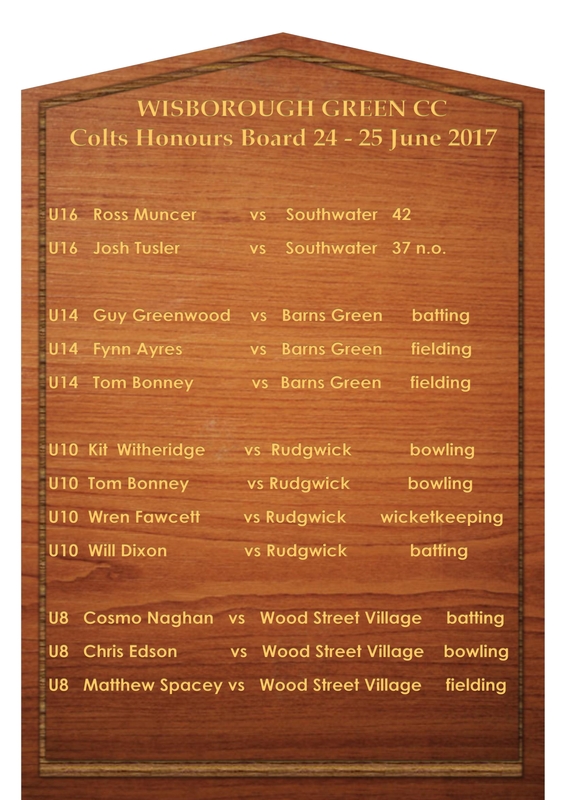 Well done to Chris Edson whose was the highest wicket taker for Wisborough Green with two wickets falling in his spell. Overall a great team performance with the ball and in the field saw Wisborough Green restrict Wood Street Village to a total of 253 off their 16 overs. Congratulations to all the Under 8’s who all contributed to a great team effort to win their first game by 20 runs.